What is specialty cold heading? Cold heading is an established manufacturing process, where metal wire is shaped, by being forced into a punch and die set, without loss of material. A simple metal blank is cut from wire or bar and transferred to a punch and die station where the metal blank is pressed into the shape of the punch and die set in a completely contained manufacturing process. The mechanical force of the punch being driven into the die where the metal blank is contained causes the metal to flow around the punch and take the shape of the punch and die without loss of any material. Because the metal forming process is done at room temperature and no heat is applied to the metal, the process is called cold heading. Specialty cold heading uses the same basic cold heading process of punch and die metal forming, however it is focused on lower volume parts manufactured from higher cost materials such as copper, bronze, and aluminum. Our specialty cold heading delivers the low-cost production advantages of the high-speed automated cold-heading process, and at significantly lower production volumes. MFI’s unique combination of its specialty cold heading process coupled precision, secondary CNC machining to manufacture low volume parts, allows our customers to achieve total part cost savings of 35% or more compared to conventional machining with material cost savings of up 50% without the requirement for high production volumes. *4 die cold heading progression to be moved through precision machining. What are the challenges of specialty cold heading? The challenge with specialty cold heading are how does an engineer achieve the superior physical properties and high material cost savings benefits of a cold headed part without spending thousands of dollars on cold header tooling? Before MFI, a standard cold heading process required high volume production in excess of 100,000 pieces in order to absorb the high costs of tooling in order to deliver the cold heading benefits of material content savings and faster machining time. What does MFI do that is unique with specialty cold heading? The standard cold heading process requires large production quantities from 100,000 to 1,000,000 pieces and higher to absorb the high cost of cold header tooling. At MFI we use our internal tool manufacturing capabilities and quick-change tooling processes, to cost-effectively manufacture specialty cold headed parts in production quantities as low as 1,000 pieces. 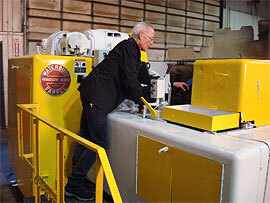 Our specialty cold heading process brings high volume production cost savings to our low volume customers. What are the primary benefits of specialty cold heading compared to conventional machining from solid material? 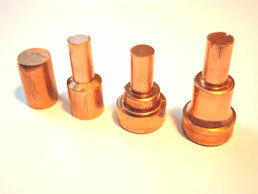 An MFI customer was purchasing 30,000 copper, machined components per year at a price of $3.00 per part. This customer asked MFI to evaluate whether we could use our specialty cold heading process to reduce their purchase costs. Using our cold heading engineering expertise and unique low-volume cold heading process, we were able to design a two-step, specialty cold heading and secondary CNC machining process that reduced their purchase cost to $2.25 per unit. This was a 25% cost savings for our customer. Some typical product configurations that lend themselves to specialty cold heading are shown below. Metal Forming Industries’ Indiana USA based specialty cold heading process reduces waste and machining cycle times, thereby driving total manufacturing costs lower and that allows us to offer Made in America quality at globally competitive prices.